Dena Dyer is a dear friend, an accomplished writer, book author, speaker and singer. She’s also a heart sister. And guess what? She’s right here, blessing us with an important message about loss and love for #TellHisStory. A friend of mine lost her eighteen-year-old in a horrific car accident, and one of the ministers at her church said to her a few months later, “I thought you’d be better by now.” As if there were statutes of limitations on grieving. As if losing a child was something akin to having surgery. He asks us to wait in the garden—not to fall asleep—to watch and pray with those who are facing tremendous grief, to the point of sweating blood. He wants us to be patient with them as they wrestle with their faith and doubt. Can we refrain from giving easy answers, and not give up on our friends as they struggle to find solid ground again? Can we just sit with our relatives and be quiet, entering their sorrow with humility and tears? Remember—this is what Jesus did at the grave of Lazarus, whom He loved. Before He performed a miracle, before He prayed or spoke the truth through Scripture, before He displayed God’s power over death, He entered the suffering of Mary and Martha. I love this Jesus! He could have marched to the tomb and given orders, knowing that the ending would be happy. Instead, He took time to listen to His friends’ questions, interact with them, and cry with them. I imagine Him reaching out His hands to pull Mary up after she had fallen to her feet in front of Him. I see Him embracing Martha after she spoke of her belief in His divinity. After all, He wasn’t just the Savior of the world—He was human. And through His loving mercy in the face of earthly loss, He shows us how to be a friend to those who truly need it. As the Creator, one who set up the parameters of life and death before He formed the world, Jesus knew loss was a certainty—but He chose love (not fear or solitude). Throughout Scripture, we see God the Father and God the Son choosing love, pointing the way for us. So the question is: will we choose love or fear? Solitude or relationship? Especially after devastating losses, will we reach out again and embrace life as the beautiful, mysterious, and ultimately worthwhile risk it is? I believe that those who’ve preceded us in death love us even better in heaven, because they don’t have the baggage we have on earth. And the love we share with them will be fully realized in our eternal home, much more than it ever was on earth. If we allow Him to, God takes the love that weaves into and out of our lives and creates a beautiful tapestry. Love—whether it is reciprocated or not—is never wasted, because God is love. Doesn’t Jesus say that whatever we’ve done to the “least of these,” we’ve done unto Him? So even love that can’t—or won’t—be returned is an offering to Him, one that serves and pleases Him. 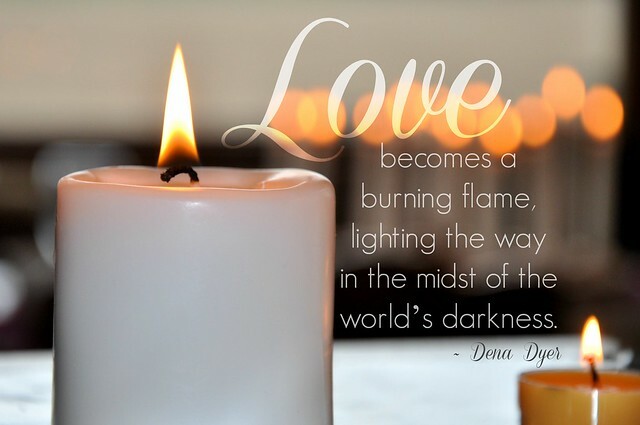 That love becomes a burning flame, lighting the way in the midst of the world’s darkness. Howie Batson, Jesus, Our Hope of Resurrection” (sermon, First Baptist Church, Amarillo Texas, February 29, 2012). As a busy mom, wife, author, and speaker, Dena Dyer adores her life—but there are days when she wants her own mommy! Thankfully, she has God, her mom, and a counselor on speed dial. Dena is married to Carey and they have two boys, Jordan and Jackson. When she’s not desperately trying to find her cell phone, she’s at her keyboard or in her favorite reading nook. Her writing credits include the books Wounded Women of the Bible (Kregel, 2013) with Tina Samples, Let the Crows’ Feet and Laugh Lines Come: Rediscovering Beauty and Self-Worth at Any Age (2010, Barbour), Grace for the Race: Meditations for Busy Moms (2004, Barbour), and The Groovy Chicks Road Trip series (2005, 2006, Cook, co-authored with Laurie Copeland and a lot of groovy girlfriends), numerous compilations and anthologies,and magazines such as Family Circle, Redbook, Ladies’ Home Journal, and Parenting. Her hobbies B.K.–before kids–included scrapbooking, watching old movies, and decorating. Now, her interests (obsessions?) are cooking, napping and hanging out with friends. When the opportunities present themselves, Dena loves to speak to groups, lead worship, and give television and radio interviews. But her favorite place of all is home, where she nests with her three “boys” and tries to ignore the dust. 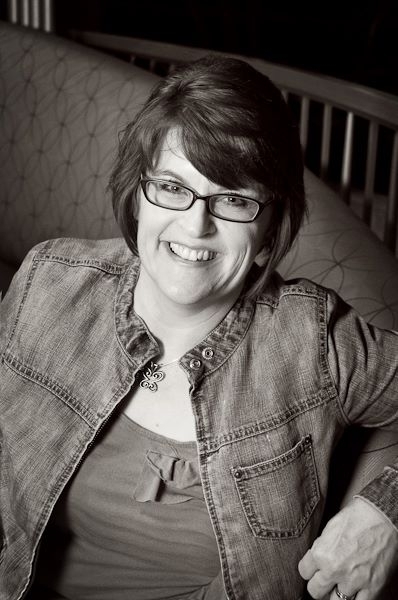 Check out Dena’s newly released book, Wounded Women of the Bible by clicking here. I am honored to have a story printed in this beautiful book. You will meet Jesus in these pages. I’m giving this book away today. To enter the giveaway, simply leave us the name of a Biblical woman you most relate to. Share this post on any social media site for extra chances to win. UPDATE: A winner has been drawn randomly. Commenter Laura will be notified by email and will receive a copy of Wounded Women of the Bible. Thanks for sharing, everyone. Yes, Jacqueline. I get this one. Thanks for being the first tonight. Thank you for sharing and commenting, Nanette. 🙂 I am a recovering perfectionist, so I have those “Martha” tendencies too. Great post! I have been a Martha … type A organizer, servant. Becoming a Mary. Will be sharing on Facebook. The woman with the alabaster container of perfume that washed Jesus with the perfume to show her appreciation of deliverance. Yes. What an offering of love. Thank you, Kelly. Mary…..I gave up my son! As a Pastor, I’m suppose to have all the answers! No! Only God has those! But in this life we walk certain walks to help others in their walks! God gives us strength! MaryAnn, I’m so sorry you had to give up your son. And no, we don’t always have the answers. Praying God comforts you as you move through your grief and pain to minister to others. I am so sorry, MaryAnn, for what you’ve had to walk through in losing your son. May God continue to give you strength during this tough journey. I most often think of Hannah…and I have a son named Samuel, much in part because God heard. My Tell His Story reflects some similar themes of grieving. Today is the anniversary of my dad’s death. Today is my son’s first day of school. Writing about those colliding. Melanie, I love that your son is named Samuel. And I pray that God comforts you as you remember your dad–and let go of your child, at least temporarily–today. Oh Melanie… I’m seeing this at the end of my day. I pray you’ve found some time to reflect and remember, but no doubt today was painful for you. Will be over to read your story soon. To be honest, I don’t think I’ve come to stop grieving for my friends who died at aged 26 and 36. My bowling buddies. Though we were all busy in our bowling career, making it to the top of the game and giving all we got and got nothing in return but loneliness along the champion’s path. I don’t think I’ll ever stop grieving over them as along life’s lonely road those days, moments of just having a meal together seemed such a simple and useless thing. But after they are gone, the meal was delicious. The Taiwan plums were so lovely. I suppose sweet like me. Friends were not allowed and moments of nothing but some half hour of laughter together was … made it easier to go on. Training. It was all we ever had really. Rain or shine. Sunshine or … Training. Each of us. The two lanes and me. What a waste of a good life. Simple people. Making it to the very top. What cost. Will I ever stop grieving. Probably not. The early 2000’s were really tough times for me. We were so polite to each other. So kind. In the midst of the storms of the game. We found moments of happiness and laughter. We became a person and not robots. Hi Kazzeo … It sounds like you had a really strong bond with your friends. I’m so sorry for your loss, and for all you’ve been through. I hope you’re able to hang on to those moments of fun and laughter, to pull you through the times of great grief. My eyes played a *bad* trick on me. When I first started reading this article, I read “one of the monsters at her church” instead of what it said. When we lost our first, there were folks who wanted the grief to be over on their (completely arbitrary) timetable. Glad I learned how to tune out voices I didn’t need to hear back in my using days – the training came in handy. I’m a guy, but nevertheless – Rahab. I know the lifestyle, and living below what we’re called to be – as well as being part of the family tree. Rick–and Mary, below–I know words can’t do justice to your loss, and I can’t imagine the pain you’ve endured–but I am so, so sorry you had to suffer losing a child. I am also deeply sorry that people hurt you with their words. Mary, I agree–I think we have to walk through something before we know what to say. Hopefully, if we haven’t “been there,” we will just pray and hug and listen. I pray that God continues His healing work in your lives. Thank you, both, for reading and commenting. Wow. You humble me, Rick, with your words. 🙂 God bless you as you reach out to others in His name. Thanks for sharing, Rick. You get this one, don’t you? My daughter died 21 years ago on June 12th. Someone said those exact words to me before we left on vacation the middle of July…it had barely been 4 weeks. Losing a child is the hardest things I have endured on this earth…but God is good, I lived through the trial and have come out on the other side of the darkness. Sometimes I think only those that have lived thorough it know what to say…sometimes that is nothing, sometimes it is something. Like…I am praying for you or I want you to know I thought about ____ and say the deceased persons name. We desperately want to know that others remember too. Jochebed – the mother of Moses. When she heard that Pharaoh was going to kill all the male Hebrew babies, she built a boat. She put her baby’s life in God’s hands – but not by just standing by – she was proactive. She built a boat. That’s me. I build boats. Yes, I, too, am that Type A organizer who relates to Martha and sometimes gets frustrated by the Marys who sit at the sidelines. As always, I’m a work in progress. Thankfully, I’m loved even when I get it wrong. Thanks for the opportunity to link up. I relate most to the “Woman at the well”…and I’ve had my Gomer moments too. I’m linking this everywhere. Beautiful stuff! Loretta, thank you for your kind words and for sharing this post with others. 🙂 God bless you! Beautiful truth! I was just telling a lady the other day that one the things I’ve learned about healing from the death of a loved one is that you never really “get over it” I lost my mom 22 years ago. I don’t ever want to “get over it” God has a way of shaping us and growing us because of those losses. Like always…He brings beauty out of pain. Thanks for this. Eileen, I’m so sorry you lost your mom. You must have been young when that happened. I agree–God has a way of bringing light out of the dark. May God continue His healing mercies in your life. Martha, always taking care of others and not often stopping to think what I need or want. Praise Jesus, I am learning to embrace Mary and site at Jesus’ feet and love him with my whole heart. Patti, as a Martha “do-er” by nature who is learning (SLOWLY) to be more of a Mary spirit, I will praise Him with you for that! That’s no small thing. I pray you learn to let Him love you wholly, too. Blessings! Mary Ann, you are one of the most godly women I know. Thank you for all the lovely ways you have loved me and many others as a mother. This was one of my FB status updates today from daily readings in Mark referring to the woman with the alabaster jar: All we know about this woman is that she was in Bethany, she has expensive perfume and she wasted it on Jesus head. And the whole world knows about it. Perhaps this is a lesson on what it means to be truly famous. It’s not about making a name for yourself but honoring The Name. I want to be like her. Shelly, that’s good stuff. Thank you for sharing. I like the parallel you drew from that story about not making a name for ourselves but honoring Him and making HIM famous (as Mary DeMuth says). Hugs! From the way I came to The Lord ….Mary magdalene ….I love the song alabaster box….if you have never heard it I would say its worth a listen…but now that I have been walking many years with Jesus…she is who I most long to be like. This is a beautiful post. Ro, thank you. 🙂 And I agree–that IS a gorgeous song. I think I most relate to the woman with the issue of blood. I don’t have a physical problem, but there have been bleeding soul wounds that He has healed, is healing, as I have desperately grasped the hem of His garment. Sarah and Elizabeth (love your biblical names! ), I can relate to all those women, too. I love how the Bible is so relate-able to us, today in the 21st century. May God continue to heal you as you press into His love. 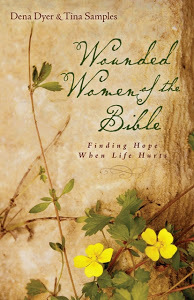 To all of you have commented, you will love “Wounded Women of the Bible,” Dena’s & Tina Samples’ new book. It’s written for women just like us. P.S. Jennifer, like you, I have the book. So don’t enter me! In the book of Luke there is a woman who lived a life of sin. She was brave enough to walk right into a dinner party & she washed Jesus’ feet with her tears. Not one person at that party offered to wash His feet but she did. She took a chance and was forgiven by the Son of God, how awesome would that be? The Savior, he saw her, he saw beauty in this sinful woman. Simply Amazing. I am in awe whenever I read that story, the tears flow freely…every time. Tracy, Your description of this gives me God-bumps. Thanks for sharing in the comments. You’d love this book. Love you, friend. Hannah. Her story has helped me so many times when God has called me to wait, especially during a few years of infertility that led to amazing adoption stories. This post has touched me so for I lost my mother this past January after 15 years of caregiving. God has blessed me with the most sensitive husband who walks right beside me and never questions my “stage” in this process. He just is there and loving me through each step whether forward or back. Yes, there are those who ask or question my “condition” and I can only pray that God will walk me through those moments too. The woman I identify with more often than many others is the woman who touched the hem of Jesus’ garment asking for healing. I have been through many physical issues, still am, and reaching out, not being afraid, I touch His hem and know that He knows I am there and need Him. I am so grateful for His love and care for me. There are NO easy answers but we go on trusting that all will be well. Jesus has loving arms to hold us when we run to him. I relate to one of the wounded women in the Bible. I won’t say who because I don’t want to be so public with it. I bet she’s in the book. I hope to find out. Maybe I’ll win it but sounds like a book I will want to read either way. Dena, so lovely to read your words here. Congratulations on your new book — looks like a great read. Thank you for sharing the story today. I have been on the receiving end of “you aren’t OVER it yet” comments and so I know the hurt. I was so blessed by the reminder of how Jesus responded to death, and how He entered in to Mary and Martha’s mourning with them. I am most like Martha, constantly doing, and forgetting to take the time to be still and listen. I shared the link on my FB page, with encouragement to read and have a heart of mercy toward those who are hurting. Thanks for sharing your thoughts, Jennifer. I’m sorry you’ve had to be on the receiving end of such comments. Thanks for sharing on FB; we’ll put your name in the drawing twice. Ouch, when I read the story about your friend, who lost her daughter…thank you for your compassionate words here, and Congrats on your book …will share on FB and twitter. Thank you, Dolly. For the kind feedback, congrats, and sharing! I read Denya’s beautiful, but also heart wrenching post earlier in the evening, and been considering who I most relate to. So difficult, as could see elements from a few 🙂 but I think I will go with Abigail. It sounds like a wonderful book. I wish all the best to who ever wins it. Have shared on Twitter, Facebook and Pinterest. What a GIFT from God to hear these truths about love and loss. The woman with the alabaster jar has been a long-time favorite, but I currently identify with Naomi in the bewilderment and disillusionment that she faced on the journey. By faith I choose to believe that God will restore joy in His way, in His time, as He did for Naomi. I am a combination of Mary and Martha. Longing for stillness in a hectic world. Shared on fb and Twitter. Although I have Martha tendencies, I am definitely working at being more like Mary. It has become a much more satisfying way to live. I re-posted Nannette’s pin on Pinterest yesterday to share this book before I knew about the contest. It looks so good! I definitely plan to read it. Thanks for a touching and enlightening post on grief, loss, and remembering to serve others as Jesus would have. It was an honor to post here, Candace. Thanks for helping get the word out about the book! My “faith-personality” is Sarah-Ruth. On the one hand, I can laugh in my tent that God’s promises couldn’t possibly apply to my situation. On the other hand, I can look back, as Ruth must have, and see that God has miraculously engineered circumstances to guide me and bless me. Praise God that, in spite of my split-personality, he never abandons me! Beautiful message Dena. After suffering much loss in our family I have learned that silence is okay, that coming beside, just holding a hand, can speak much louder and way more eloquently than my fumbling words.